The library is at the heart of the student experience, a key resource that plays a unifying role throughout the student lifecycle. Traditionally a place of solemn work, the library today is as much a place to study as it is a place to live. Societal and technological shifts have necessitated that we re-imagine approaches to learning with variety and flexibility the main demand from students that have now, in a sense, become high fee paying customers. A new 24/7 culture seems to have become the norm with library use as students embrace the whirlwind of multi-tasking and high intensity workplace trends. They have become places to camp out, catch up and counteract the isolation of internet learning. Having recently designed a library space in competition for a university refurbishment we have a renewed appreciation for the need to future proof such places. Learning outcomes are greatly affected by the quality of internal environments and as academic institutions strive to remain relevant the importance of innovation is not to be underestimated. Today’s student works with varied media, including online resources, books, social media and music. By incorporating a variety of working spaces the library becomes an inclusive environment; a hub for collaboration, fellowship and debate. Break out spaces and catering facilities are key inclusions as is the integration of technology. The latter might prove challenging for university library buildings of historical significance where listings impose restriction, but any challenge is simply an invitation for more creative solutions and in a future that will surely transform again and again that is something to embrace. 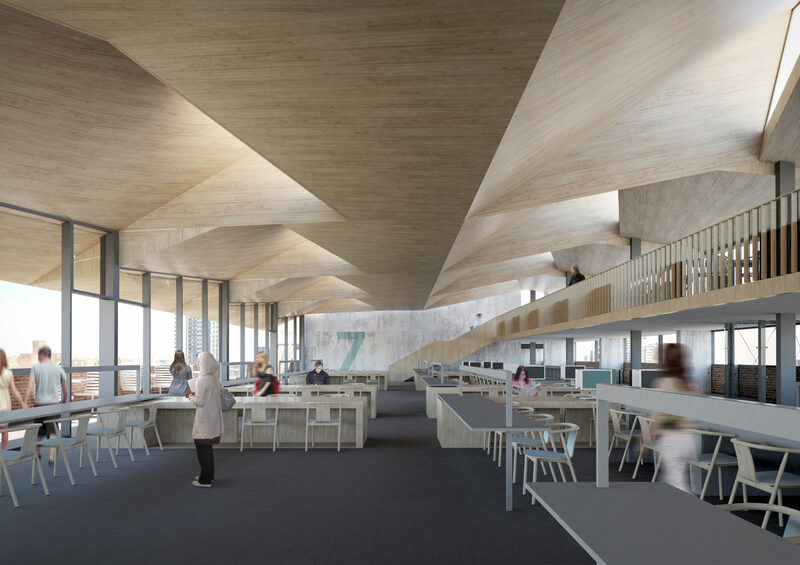 Library competition entry designed by LTS Architects for a London university.